The Envirolite Slimline Silverpac 26kW is a condensing, floor-standing, Regular oil boiler that can be installed externally to save you space around the home. Designed and manufactured by Firebird, this is a highly efficient boiler, shown by its seasonal efficiency rating of 93% and ErP A rating. This is a perfect boiler for medium-sized homes that don’t have such an excessive need for heating and hot water as it has an output rating of 26kW. The range also includes boiler outputs of 20kW and 35kW, for smaller and slightly larger homes that do have a higher demand for heating and hot water. 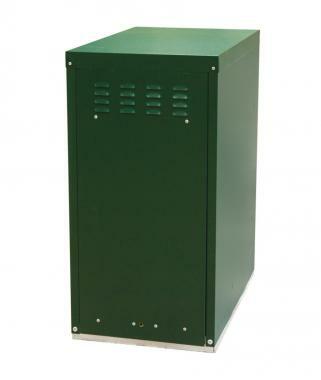 This highly reliable boiler has also been designed so that it is weatherproof. Thanks to its high-quality weatherproof PVC coated casing you can be sure that the boiler won’t let you down no matter what weathers are thrown its way. With this highly reliable boiler being an regular boiler ( also known as heat only or conventional ) this reliable boiler heats your central heating system directly and also produces hot water for your cylinder. Due to the fact that you need a hot water cylinder which is often fed by a cold water storage cistern located in the attic due to this the boiler type is not always suitable for the smaller properties or homes where space may be limited. Some of the many features of this boiler include blue and yellow flame options, fully insulated and acoustically designed for ultra-quiet in operation, a PCB controller using highly accurate thermistors with anti-cycling functions, multiple tapping points for ease of installation, factory fitted frost-protection stat , removable side for ease of access, multi-directional flue option, a stainless steel terminal guard, high-performance burner complete with full diagnostic control box and a frost thermostat which means that it will be able to keep running all year long, especially in the months when you need it most. The Envirolite Slimline comes with a 2 year warranty which will help to give you the peace of mind that this boiler won’t be letting you down.